While playing a live gig at the Bridge House in Canning Town, the band was approached by Daniel Miller (an electronic musician and founder of Mute Records), who was interested in them recording a single for his burgeoning label. The result of this verbal contract was their first single "Dreaming of Me", recorded in December 1980 and released in February 1981, reaching number 57 in the UK charts. Encouraged by this, the band recorded its second single "New Life", climbing to number 11 in the UK charts. Three months later, the band released "Just Can't Get Enough" - its first single to enter the UK Top 10, peaking at number eight. 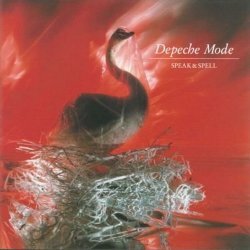 This record was in many ways a breakthrough for the band, and its success paved the way for its debut album - Speak & Spell, released in November 1981, and eventually reaching number ten on the UK album charts. Critical reviews were mixed - Melody Maker described it as a "great album... one they had to make to conquer fresh audiences and please the fans who just can't get enough", while Rolling Stone was more critical, calling the album "PG-rated fluff".